Used for commercial and private aircraft. Resistant to jet fuel and higher aromatic aviation gasoline’s. Compatible with use on hydrant service. Meets EI 1529, 6th edition, 2005 and European Standard BS EN 1361, (2004) and NPFA 407. Recommended for all types of riser deck, reel, and hydrant hose applications. All aviation hose assemblies are 100% hydrostatic tested to 600 PSI. All aviation hose assemblies are 100% inspected for electrical continuity. Every hose receives a unique serial number and test certificate. Roman Seliger 4-bolt aluminium clamped reusable fittings. Couplings: Permanent brass internally expanded fittings – male and female NPT (swivel nut) Reusable 4-bolt aluminium clamp fittings – male and female, NPT and BSP threads – all females have swivel nuts – available with brass, tin plated brass, and stainless inserts. 4-bolt aluminium clamps with brass, tin plated brass, or stainless inserts. EI 1529 and EN ISO 1825: NPT male, NPSH female, BSP male, and BSP female threads (swivel nuts on female fittings). 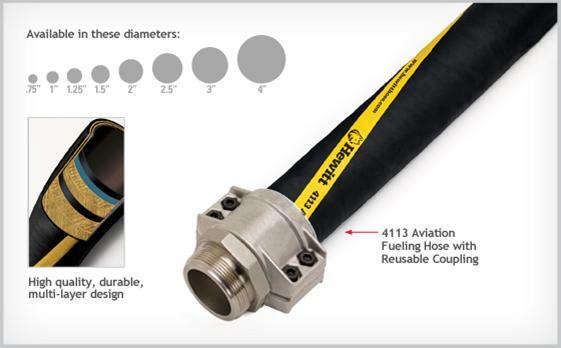 This aviation fuelling hose is recommended for all types of riser deck, reel, and hydrant hose applications. Resistant to jet fuel and higher aromatic aviation fuels. Meets both EI 1529, 6th edition and European Standard EN ISO 1825 2011, Type C, plus NFPA 407. Functional in temperatures -40°C to 82°C (-40°F to 180°F). All aviation hose assemblies are 100% hydrostatic tested to 600 PSI and inspected for electrical continuity. Every hose receives a unique serial number and test certificate. Utilized worldwide by major airlines and oil companies. Male and female cam & groove (mil spec available), TTMA flange, and 150 lb. flange. Aluminium, brass, and stainless. All adaptors installed with sealant and retested to adaptor ratings. Used to extend hose life, prevent kinking and reduce abrasion. This hose coil is excellent for extending hose life, preventing kinking on deck and reel hoses, and reducing abrasion to the hose cover. Installing the coils at the hose reel outlet riser will prevent hose collapse and maintain high fuel flow. Each hose coil will cover from 2 to 4 feet. Coils available to fit 1″ to 4″ ID aviation hose. Easily installed either by the factory or in the field. Standard white hose coils available from stock. Special colours can also be supplied as well as an extra tough urethane hose protector coil.